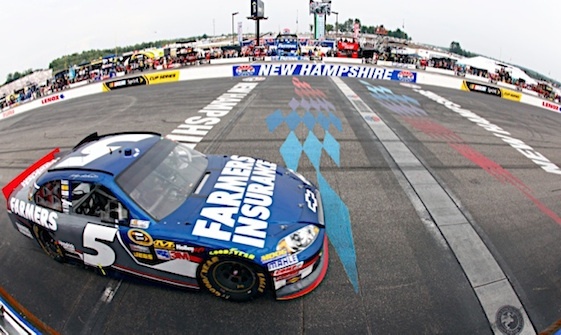 LOUDON, N.H. – Denny Hamlin never had a doubt that he had the best car in Sunday’s NASCAR Sprint Cup race at New Hampshire Motor. In fact, nobody watching the race doubted that, either. But, like the old saw says, having the fastest car doesn’t mean you’re going to win the race. 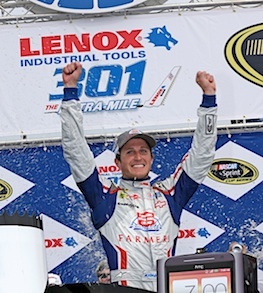 Kasey Kahne grabbed the victory in the Lenox Industrial Tools 301 after Hamlin and crew chief Darian Grubb had what turned out to be a major miscommunication on a pit stop during the last caution period of the race. Hamlin, whose Joe Gibbs Racing Toyota led 150 of the 301 laps on the one-mile oval, held a lead of more than 5 seconds when NASCAR waved the yellow flag after spotting oil on the track on lap 235. As the cars slowed to get behind the pace car and prepare to pit, Hamlin and Grubb were talking strategy. Most of the contenders, including Kahne, who took the lead, changed two tires, while Hamlin’s crew changed them all and started 14th on the restart with 61 laps to go. The determined Hamlin made a charge toward the front, using those fresh tires and the fastest car on the track to slice through the pack, finally getting to second place 24 laps from the end. He cut into a 5-second margin by Kahne but faded in the final laps to finish 2.738 seconds _ about 10 car-lengths _ behind. “We still had a shot at a win, we just didn’t get past the cars quick enough and just didn’t have enough there at the end,’’ Hamlin said. “But I’m still proud of our team. This is the best car I’ve had here and we’re going to win the one that counts, that’s in September. Kahne said he definitely did not feel like he stole the race from Hamlin. Still, he breathed a sigh of relief when the checkered flag waved. “If he was good keep the track position, I never would have passed him,’’ Kahne admitted. And there were some tense moments at the end. Clint Bowyer finished third, followed by Dale Earnhardt Jr., Brad Keselowski, Jeff Gordon, Jimmie Johnson and new dad Kevin Harvick. Series leader Matt Kenseth finished 13th and saw his lead over runner-up Earnhardt cut to 16 points. Greg Biffle finished ninth on Sunday now remained third, 40 points behind Kenseth. 1. (2) Kasey Kahne, Chevrolet, 301, $220,275. 2. (3) Denny Hamlin, Toyota, 301, $228,751. 3. (5) Clint Bowyer, Toyota, 301, $161,549. 4. (9) Dale Earnhardt Jr., Chevrolet, 301, $120,360. 5. (22) Brad Keselowski, Dodge, 301, $141,130. 6. (8) Jeff Gordon, Chevrolet, 301, $142,721. 7. (7) Jimmie Johnson, Chevrolet, 301, $135,771. 8. (12) Kevin Harvick, Chevrolet, 301, $136,721. 9. (11) Greg Biffle, Ford, 301, $97,735. 10. (6) Ryan Newman, Chevrolet, 301, $128,968. 11. (4) Martin Truex Jr., Toyota, 301, $114,399. 12. (10) Tony Stewart, Chevrolet, 301, $134,110. 13. (27) Matt Kenseth, Ford, 301, $134,071. 14. (16) Joey Logano, Toyota, 301, $91,060. 15. (15) Brian Vickers, Toyota, 301, $83,235. 16. (1) Kyle Busch, Toyota, 301, $132,168. 17. (13) Paul Menard, Chevrolet, 301, $89,635. 18. (21) Carl Edwards, Ford, 301, $123,676. 19. (20) Marcos Ambrose, Ford, 301, $108,593. 20. (28) Jamie McMurray, Chevrolet, 300, $112,593. 21. (25) Jeff Burton, Chevrolet, 300, $118,510. 22. (24) Sam Hornish Jr., Dodge, 300, $120,760. 23. (18) Bobby Labonte, Toyota, 300, $105,718. 24. (14) Kurt Busch, Chevrolet, 299, $103,418. 25. (31) Juan Pablo Montoya, Chevrolet, 299, $109,476. 26. (17) Regan Smith, Chevrolet, 298, $100,818. 27. (39) David Gilliland, Ford, 298, $89,993. 28. (23) Aric Almirola, Ford, 298, $114,971. 29. (29) Landon Cassill, Toyota, 297, $104,005. 30. (30) Travis Kvapil, Toyota, 297, $96,457. 31. (37) Ken Schrader, Ford, 294, $84,710. 32. (43) Stephen Leicht, Chevrolet, 293, $83,435. 33. (26) David Reutimann, Chevrolet, Engine, 229, $73,735. 34. (19) David Ragan, Ford, Engine, 139, $73,535. 35. (40) David Stremme, Toyota, Vibration, 101, $73,335. 36. (33) Casey Mears, Ford, Vibration, 91, $73,110. 37. (32) Josh Wise, Ford, Brakes, 82, $72,905. 38. (34) Joe Nemechek, Toyota, Brakes, 71, $72,678. 39. (35) Dave Blaney, Chevrolet, Brakes, 68, $69,850. 40. (36) Michael McDowell, Ford, Vibration, 63, $69,700. 41. (41) Scott Riggs, Chevrolet, Vibration, 32, $69,525. 42. (42) Kelly Bires, Ford, Brakes, 19, $69,400. 43. (38) JJ Yeley, Toyota, Engine, 4, $69,767. Average Speed of Race Winner: 116.226 mph. Time of Race: 2 Hrs, 44 Mins, 24 Secs. Margin of Victory: 2.738 Seconds. Lap Leaders: Kyle Busch 1-66; D. Hamlin 67; J. Gordon 68; J. Johnson 69; Kurt Busch 70-71; D. Hamlin 72-89; J. Gordon 90-93; D. Hamlin 94-153; J. Johnson 154; B. Keselowski 155-156; Kyle Busch 157; D. Hamlin 158-190; B. Keselowski 191; Kyle Busch 192-196; D. Hamlin 197-234; C. Bowyer 235; K. Kahne 236-301. Leaders Summary (Driver, Times Lead, Laps Led): D. Hamlin 5 times for 150 laps; Kyle Busch 3 times for 72 laps; K. Kahne 1 time for 66 laps; J. Gordon 2 times for 5 laps; B. Keselowski 2 times for 3 laps; J. Johnson 2 times for 2 laps; Kurt Busch 1 time for 2 laps; C. Bowyer 1 time for 1 lap. Top 12 in Points: M. Kenseth – 707; D. Earnhardt Jr. – 691; G. Biffle – 667; J. Johnson – 656; D. Hamlin – 628; K. Harvick – 622; T. Stewart – 618; M. Truex Jr. – 617; C. Bowyer – 614; B. Keselowski – 613; C. Edwards – 567; K. Kahne – 547.